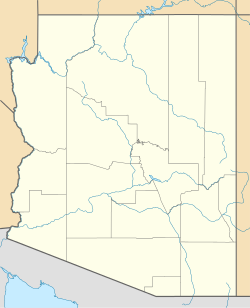 Adamana is an unincorporated community in Apache County in the northeast section of the U.S. state of Arizona. The town was settled in 1896 in what was then the Arizona Territory. Adamana was founded in 1896 when the railroad was extended to that point. The town was named for Adam Hanna, a local rancher who was a distant relative of the late Mark Hanna, the original settler of the region. Originally the place was known as Adam Hanna's, as time passed and more people came to visit, the elision of a few letters gave us the name Adamana. A post office was established at Adamana in 1896, and remained in operation until 1969. Little remains of the original community. >>”Rediscovering America – John Muir in his time and ours.”<< Part 1V A Legacy. Other Yosemities~~ P 332. By Frederick Turner. Sierra Club books. ^ Hinckley, Jim (15 November 2012). The Route 66 Encyclopedia. MBI Publishing Company. p. 5. ISBN 978-1-61058-688-7. ^ Barnes, Will Croft (1988). Arizona Place Names. University of Arizona Press. p. 10. ISBN 978-0-8165-1074-0. ^ Whiting, Lilian. "New York Times, July 22, 1906". 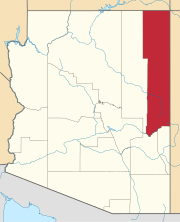 ^ "Apache County". Jim Forte Postal History. Retrieved 4 November 2015. This page was last edited on 28 December 2018, at 23:44 (UTC).